Two weeks ago, I did a home tour for Debbiedoo’s. It was so hard to put my home out there for everyone, because we have what I would call a lived in home. Nothing fancy here…most of the decor is home made by me. So after sending the post to Debbie, I nearly threw up…I just wanted to hide under a rock. But then the comments and emails started coming…with compliments and questions. You were all so kind and made me feel like I was on top of the world! 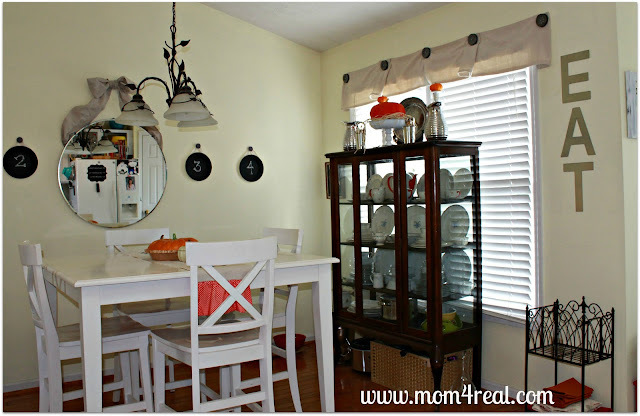 One of the most asked questions was about the valance in my dining area. What is that? What are they hung with? 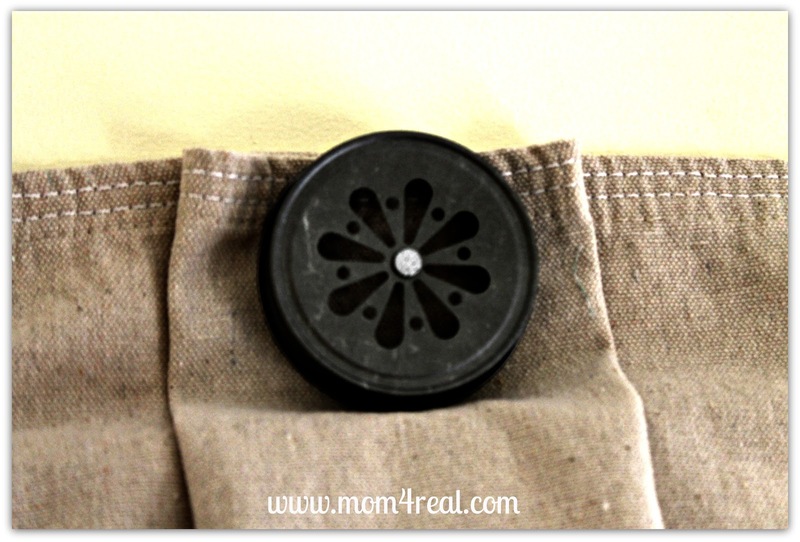 So I thought I should explain..
It’s a long piece of dropcloth…sewn all the way around, scrunched up and hung with Mason Jar Lids! Yup…that’s a nail right in the center of the Mason Jar Lids I bought from Mindy Mae’s Market…for super cheap I might add. Our walls don’t hold curtain rods unless you put anchors into the drywall, then sometimes they still don’t hang very well…especially if you change things out constantly like I do. So, no rod necessary…just hammer those babies right into the wall through the dropcloth um… errr…valance. I gotta say, I love it. It’s simple, I already had the lids and drop cloth, so free too! 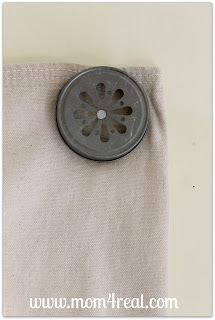 You could use fabric or an old table runner, or just about anything! Thanks for being so kind, and giving me the push to keep on doing my thing! Girl, I am so happy you put yourself out there and went for it. I knew it your home would be adored by many:) I saw your curtains pinned a LOT too..they are super! Very cute! I love it. And the best part was it didn’t cost you anything. Aren’t you the clever lady? Love it! So SUPER cute!! Love ’em. I love unique things and those are certainly unique. Very clever! I would have never in a million years thought of doing this. What a great idea! Those curtains are really just too cute for words. Like I don’t got any– just too cute! It is now a tie between the entry floor redo and this project, adore them both! I’ve never seen lids like that before – fabulous look!! So glad you came out from hiding to show off this fabulous idea! Keep em coming girl! Jessica! I love this. What a clever idea. I’ve never been a fan of curtains period (in fact I have none in my house) but this is totally cute. I definitely want to do something with drop cloths in my craft room. Sooo cute! I can’t wait to do this in my daughters house. I showed this to her, she was sooo excited. Adoreable! Showed to my daughter and we can’t wait to do this in her house. Those curtains are certainly the cutest and the mason jar lids are so clever!! !…They look wonderful on the windows…I love the room!! You have some serious off-the-grid- talent girl!!! I would have never thought to use mason jar lids in this clever way! And inexpensive too! SO cute. I love this idea! You are very creative, Jessica. What a clever idea! They look great in your space! So liking it for sure……c what we can come up with if we stare long enough….haha. For a change out too, u could use burlap!!!!! That is an unexpected, delightful accent, Jess! LOVE it!!! These turned out looking great and I love that drop cloth valance! Problem solved! What a creative way to solve your problem! 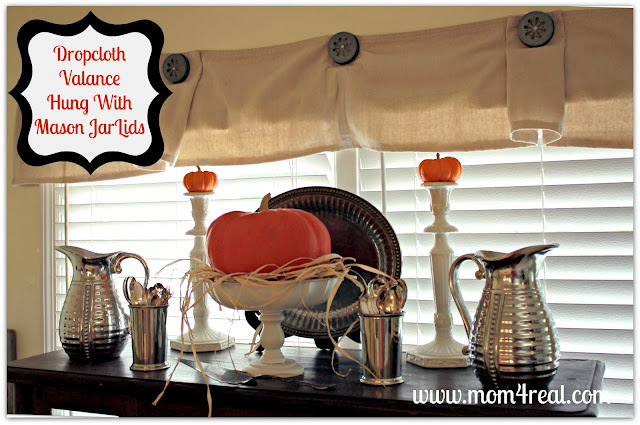 They look great and I love the dropcloth valance!